Chaminda Kularatne, a diplomat and Minister Counselor handling Consular Affairs & Immigration at the Sri Lanka High Commission in London was recently elected to the executive committee of the Consular Corps of London. This is the first time in the Sri Lankan diplomatic history that a Sri Lankan diplomat was appointed to this committee. Mr. Kularatne’s election is for a period of three years and an Asian diplomat is to hold this position after five years. Diplomats from Cyprus, Belgium, Seashells and Latvia also appointed together with Chaminda Kularatne for the new Corps committee. The Consular Corps of London established in 1902 is a prestigious association of all foreign diplomatic officers handling consular affairs at the High Commissions, embassies, diplomatic missions and the honorary consulates based in London. The Association provides its members with opportunities for networking and inters cultural activities. 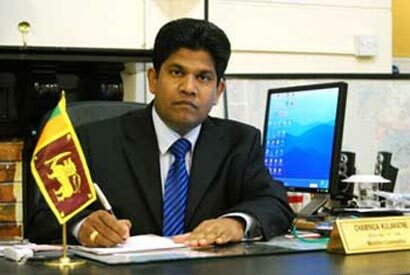 Chaminda Kularatne, is an Attorney at Law and holds a LLB. He has obtained a Postgraduate Diploma in Business Management from the University of Colombo, Sri Lanka. He is currently reading for his MBA at Kingston University, London. He was the Senior Assistant Secretary to the President of Sri Lanka prior to his posting to London as a diplomat. He has served as a member of the director board of the Bank of Ceylon and the Coordinating Secretary to the Minister of Finance and Planning. Congratulations! Sir, We are proud of you. hoping returning to diplomatic service soon, as it is indispensable having professional diplomats in very high caliber in our overseas service.